Orlando, FL – America’s Escape Game, Central Florida’s most fun, exciting and mentally challenging escape game is also one of the most artistic and detail oriented attractions on International Drive. From the beginning it was AEG’s goal to create a unique, detail oriented and immersive escape room game unlike any other in the world. The first 3 themed rooms are nearing completion and what sets them apart is they have all been worked on by attractions expert and national artist Joe Korte. Korte has over 25 years of experience and has worked for all just about everyone, including but not limited to: Walt Disney World, Universal Studios, Six Flags, Disney Cruise Lines, Showquest, Renaissance Entertainment, Arnold Palmer’s Children’s Hospital and Give Kids the World. America’s Escape Game hired Korte for his expertise in tourism, attractions, gaming and entertainment. Joe and the rest of the scenic and design team have been working on perfecting the look and experience in each room for the last few months in preparation for the attractions’ grand opening in April 2015. With the caliber of talent involved in the project, expect something that’s above and beyond your wildest dreams and get ready to get locked up at America’s Escape Game in 2015. To learn more about America’s Escape Game please visit www.AmericasEscapeGame.com or visit America’s Escape Game’s facebook page. 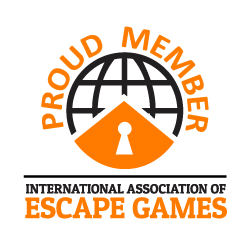 America’s Escape Game is located at 8723 International Drive in the heart of the tourist corridor in Orlando, FL. An escape game is a fully immersive, 3 dimensional, multi-sensory form of entertainment where you have to rely on your own wits, smarts, instincts and intellect to get out of a locked room. Each room is fully wired for sound and video so you’re never truly alone. Each experience comes with three clues. Your price of admission gains you access to the themed room of your choice and your own personal escape artist for the 1 hour duration in which you are in the room. Players can attempt to escape the room with friends, family, co-workers or come alone and be placed with an existing group.